Police have arrested a suspect in the fatal shooting between an MS-13 gang member and a rival gang member on a subway platform in Queens, New York, the New York Post reported. The incident, which occurred Sunday in broad daylight and caught on cellphone video, was "definitely gang-related" New York Police Department Chief of Detectives Dermot Shea said Monday during a news conference. The victim, Abel Mosso, 20, died at the scene of the shooting. He was "affiliated with the 18th Street Gang," according to police. Authorities arrested the suspected gunman, Ramiro Gutierrez, 26, Monday morning. "He [Gutierrez] has been arrested before in New York City and he has been part of a criminal group gang case before in New York City," Shea told reporters, according to WABC-TV. The Sunday incident started with someone shouting about the MS-13 gang while riding on a No. 7 train. "Someone was yelling something about MS-13," Shea said during a Monday news conference, the station reported. A fight reportedly broke out on the train, which continued after they got off. 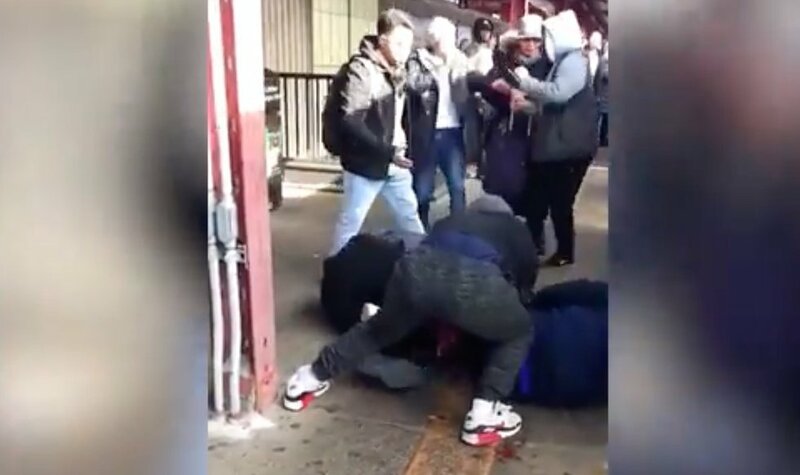 In the video, several men can be seen wrestling on the ground at the subway platform. Then man in the gray jacket reportedly stood up and pulled out a gun, firing the weapon six times, killing the victim, WABC reported. 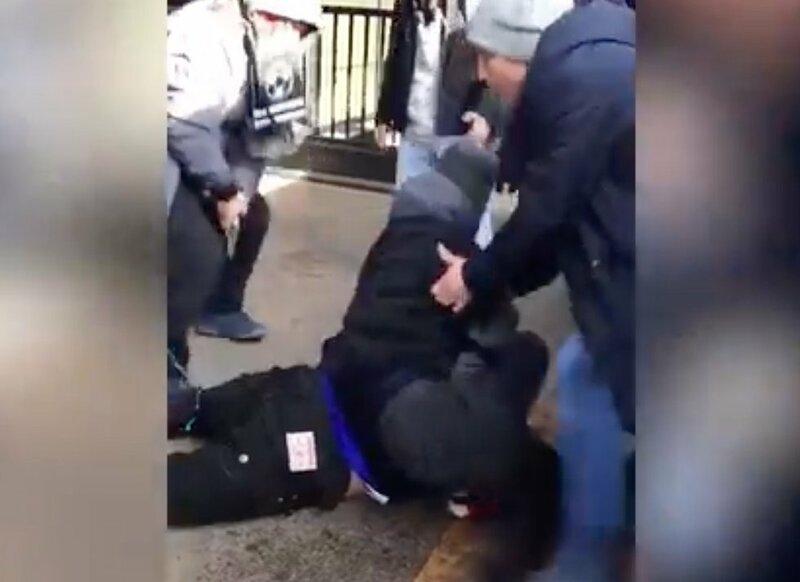 "At some point, this confrontation turns physical, and as the train approached the 90th Street Station, the dispute spills onto the platform," Shea said, the TV station reported. "There is what you see in the widely circulated viral video," Shea said. "A gun appears, and we have an individual shot. We believe approximately five or six shots are fired during this incident, striking the victim multiple times in the face." According to WABC, Gutierrez is charged with second-degree murder, first-degree gang assault and two counts of criminal possession of a weapon. He faces up to 25 years to life in prison if convicted. It's unclear what the gang members were fighting over. Has MS-13 activity increased in Queens? Shea told reporters that there have been several gang-related incidents in Queens recently. The top cop said there has not been an "uptick" in the gang's activity in the borough. "In terms of an uptick in MS-13, there have been a number of incidents in the last six to 12 months, but in terms of 'uptick' we do not see a lot of MS-13 traditionally in NYC. You have one incident like this, and obviously one is one too many. "Think about a month ago at the terrible incident in the Rockaways, where an individual was lured to a park and killed. That was then connected to another incident across the border in Nassau County," Shea continued. "But by and large, we put a lot of emphases and focus on our precision policing on gangs, the violence they drive in NYC, and when you rank the gangs we see and we target, MS-13, obviously, an incident like this will catch our attention. but I wouldn't put them at the top of the pecking order that we see day in and day out." White House press secretary Sarah Sanders made note of the incident as she pushed the president's border wall, according to WABC-TV. "There was a shooting just yesterday by what looks to be MS-13 gang members in the New York subway," she said, the station reported. "These things should not be happening if we can prevent that, and we know that the crime and the drugs and those things drastically stop if you have real border security, and that includes a wall."